opposite corner of the seating area. old Coast Guard station (010). of trees, particularly the Atlantic White Cedar. Total distance: 4.24 miles. as described by Henry Beston in "Outermost House." seashore to the old Coast Guard Station. in 1996, to prevent its tumbling into the ocean. a schedule from the Visitors Center, if you are interested. leg of the hike, and you have carefully avoided private property. distinctive woods road crossing the area from east to west. road, "Little Creek Road." It still has some vestiges of pavement. see the sign for Doane Rock picnic area. Visit the rock, if you wish. trail. Follow the trail east to the bridge over the marsh. loop is about 4.5 miles. then east on the woods road to (005). to the west at (007). 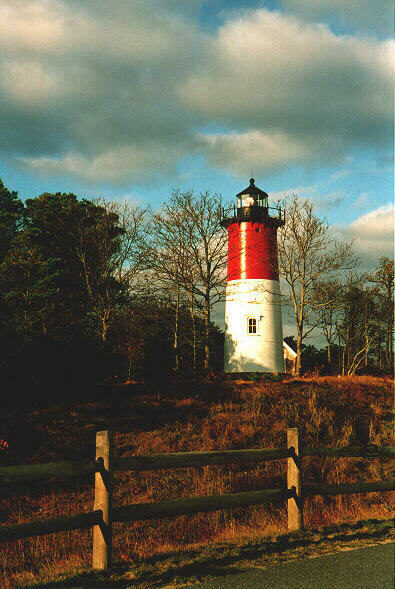 Then walk east to Nauset Light, and visit it, if you wish. is too high, walk south on Ocean View Drive from Cable Road. the Doane Rock parking area (001). About four miles. you a splendid beach walk of 3.5 miles. You must plan the walk to be on the beaches at or near low tide. 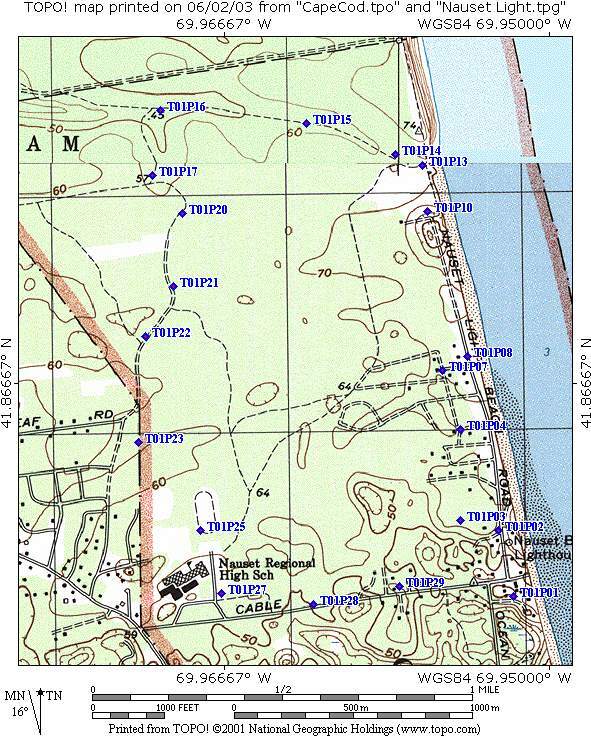 (03), and follow it north to (04), (07), and (08). do not walk out on the lip of the cliff! It may collapse under you. southeast to (25) and then south to (27). lighthouses begins at (29). Return on it to (01). The walk is exactly four miles. lot east off Route 6 (001), and then walk north to the Red Maple Swamp (002). beloved of bird watchers, because it gets you down to eye level with the ducks! to circle back counterclockwise to the swamp and its boardwalk. About two miles.